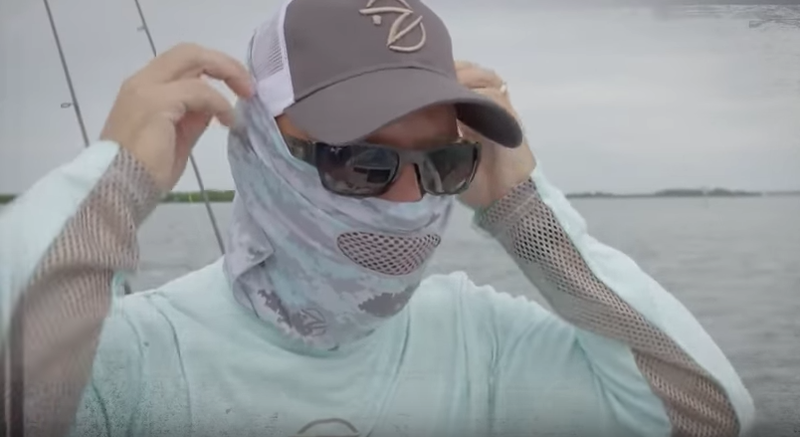 Jayson Arman tells us that because of the recent high winds, your best chance at a Snook is probably going to come around the bridges at night. Live bait anglers are doing well by netting up some finger mullet, with the 6 to 7-inch size being the most productive. 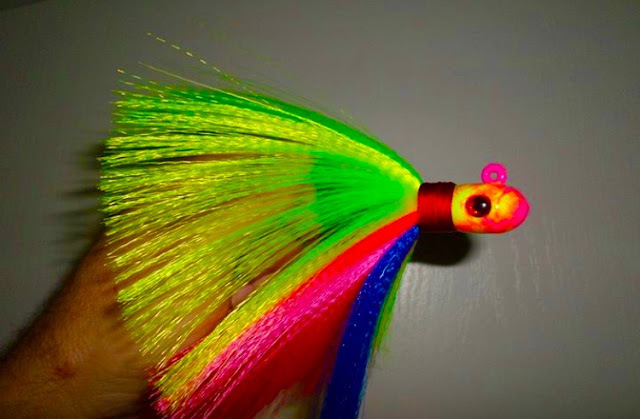 You will want to free line the mullet hooked in the mouth. Artificial bait anglers are doing well with first light jigs and with top water when things are calm. Flounder are being caught around the jetties and bridges near the jetties. Live bait anglers are doing well with small finger mullet and shrimp on an unpainted jig head. Artificial bait anglers are doing well with Gulp shrimp on a jig head or a soft plastic without a paddle tail. 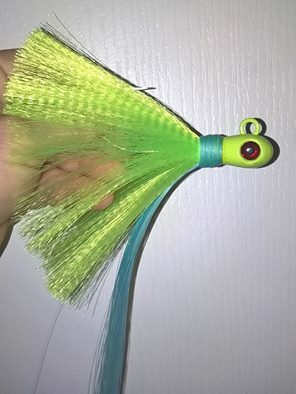 The paddle tail adds some flutter to the bait and you want something that is going to work in more of a straight up and down motion. Spanish mackerel are going to be found in the rivers blowing up on small pods of bait around the jetties on an incoming tide. Live bait anglers will want to use a smaller scaled sardine, free-lined into the commotion, rigged up on a long shank hook to help prevent bite offs. Artificial bait anglers are getting hooked up on flash minnows or gotcha plugs in the silver body yellow head color. 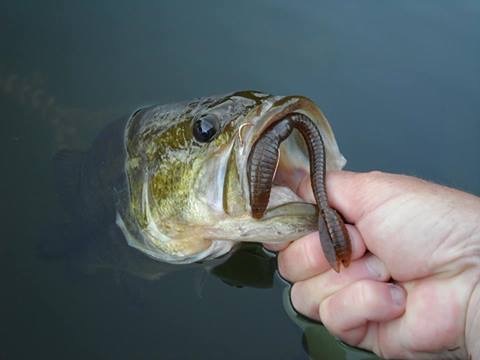 This is a great time of the year to do some bass fishing as they are on the move following bait. 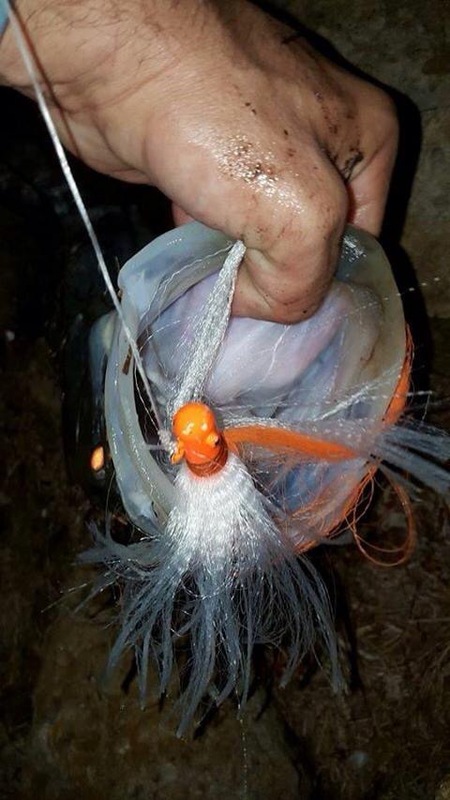 Lipless crank baits and spinner baits are probably going to be your best bet, but always make sure to have a soft plastic rigged up as a follow-up bait if they miss your faster-moving offering. INSHORE: Snook action continues to be the main game in town. Been fairly decent fishing, especially around the bridges at night. Look for the snook to be keyed in on mullet for a few more weeks, and then make the switch largely to a shrimp diet. The dirty water has pushed a few redfish inshore, and rumors of a few spotted seatrout being caught are floating in as well. Look for the inshore fishing to continue to improve as the water cools a bit. SURF/PIER: Pompano action has been the big news of the week, with some good catches coming in early in the week. 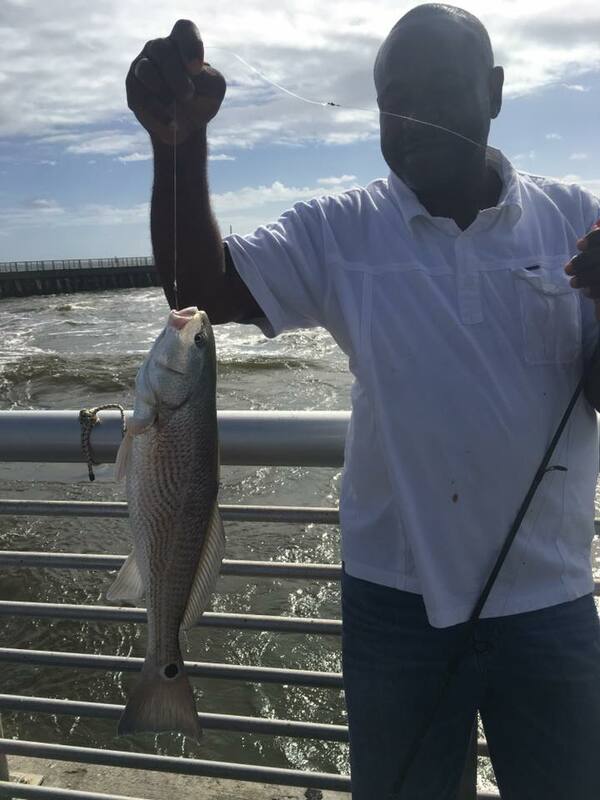 The usual baits (sand fleas, clams, and fish bites) did the trick from the surf, while Doc's Goofy Jigs caught their fair share from the pier. Fair number of bluefish around, as well as some Spanish mackerel. A few redfish still being picked off the pier. Pretty good fishing before the wind picked up, hoping it finds a happy medium and gets right for the weekend. 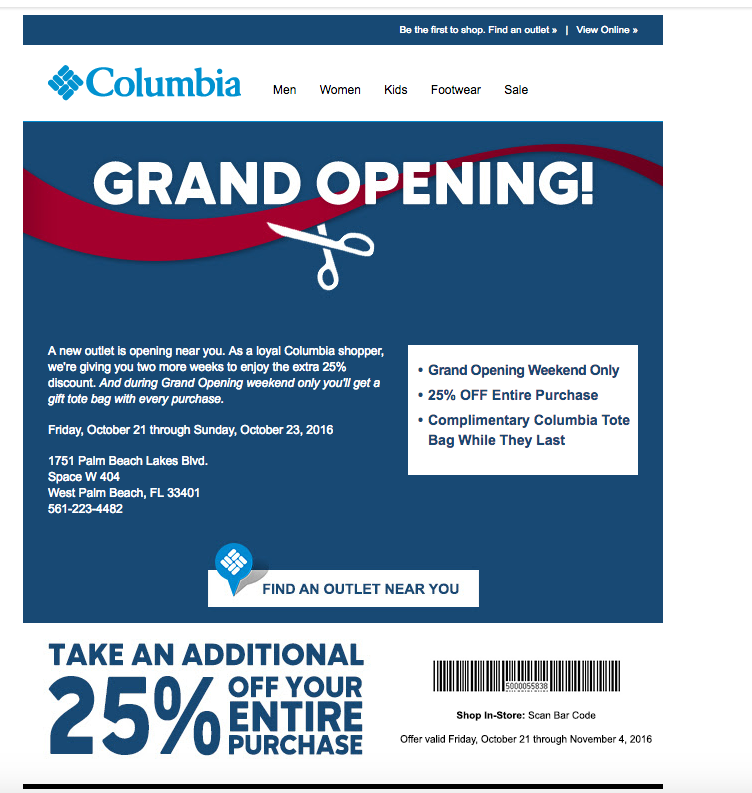 10-27-16 THURSDAY: ROUGH CONDITONS TODAY! THE NORTH JETTY REMAINS CLOSED EAST OF THE GATE DUE TO HURRICANE MATTHEW. WE HOPE TO HAVE THE STRUCTUAL ENGINEERS IN TO INSPECT THE JETTY NEXT WEEK IF CONDITIONS ALLOW. CONDITIONS DO NOT PERMIT AN INSPECTION AT THIS TIME. ONCE THE JETTY PASSES INSPECTION, WE WILL BEGIN TO REPLACE THE GRATES THAT ARE ON SITE WHICH WILL ENABLE US TO OPEN MORE OF THE NORTH JETTY DURING THE DAY. THE NIGHT TIME CLOSURE WILL STILL BE IN EFFECT. THE STATE PARK IS OPEN 24 HOURS ON BOTH SIDES BUT THE BOAT RAMPS REMAIN CLOSED UNTIL THEY CAN BE REPAIRED. We have rough conditions out there today! Winds are blowing out of the Northeast at 16 mph, gusting to 23. Waves are crashing over the rocks and rain gear is recommended. NOAA has a small craft advisory that is in effect through October 29th at 4:00 a.m. The forecast over the next few days is bleak, rough conditions will continue through the weekend. The bite is very good right now. We're seeing lots of Snook, Reds, big Jacks, Trout, Flounder, Blues, Sheepshead and a few Black Drum. We are featuring some die-hard fishing fans today that made a 17 1/2 hour trip from Maryland to fish the inlet! They said the drive was well worth it. The four men, two brothers, a nephew and a good friend have visited the inlet every year for the past five years for one week to fish the mullet run and plan to return next year. The men release all catches. Photo one features Bob Behringer with a real nice Snook he landed on the south side using a white buck tail. Photo two features Doug Vine with a Black Tip he landed on the south beach. Photo three features David Behringer with a Snook and Steve Behringer with a big Jack. Got a report from a good friend down in Deerfield Pier Area.....A few Kings, Macs, Blue fish, Lady fish Lots of jacks, Snook the mullet are there in the ICW. And the water is a lot nicer down there than up here.. The next few days look pretty bumpy out there. Snook fishing continues to be red hot in Ft. Pierce around the bridges and inlet on jigs and live bait on the outgoing tide. Fishing the Sebastian inlet with live bait during the day can produce catches of snook and redfish. Also heard of some snook and trout hitting mullet on the docks around Savannah Rd. THE NORTH JETTY REMAINS CLOSED EAST OF THE GATE DUE TO HURRICANE MATTHEW. WE HOPE TO HAVE THE STRUCTUAL ENGINEERS IN TO INSPECT THE JETTY LATE THIS WEEK IF CONDITIONS ALLOW. CONDITIONS DO NOT PERMIT AN INSPECTION AT THIS TIME. ONCE THE JETTY PASSES INSPECTION, WE WILL BEGIN TO REPLACE THE GRATES THAT ARE ON SITE WHICH WILL ENABLE US TO OPEN MORE OF THE NORTH JETTY DURING THE DAY, THE NIGHT TIME CLOSURE WILL STILL BE IN EFFECT. THE STATE PARK IS OPEN 24 HOURS BUT THE BOAT RAMPS REMAIN CLOSED UNTIL THEY CAN BE REPAIRED. It's a real pretty morning at the inlet. Winds are blowing out of the North-Northeast at 9 ph, gusting to 11 and there is a moderate chop on the water. The forecast looks like conditions will start to deteriorate tonight. NOAA has issued a small craft advisory from late tonight through Thursday night. Fall fishing is here and the bite has been very good. Even with the north jetty being partially closed, anglers are having great luck fishing from the many other areas in the State Park. Black Drum, Blues, Sheepshead and Flounder have started to arrive. Large Jacks, Snook and Reds remain active as well. Get out and wet a line! Our angler of the day is John McConaha. John and his friend Ricky fished the inlet Friday night and they reported a great night of fishing using finger mullet. The men Fished between the south catwalk and the T-Dock and landed lots of Ladyfish and one C/R Snook that put up a great fight. The Snook turned out to be John's personal best, so far! The Snook was released unharmed right after the photo. Another week of high, dirty water around the area as a result of Hurricane Matthew. Docks are gradually being repaired, but there is still debris floating around the river. With the water being dirty, be careful when running and watch out for floating things. The water is slowly getting back to normal, but expect ramps to be challenging at high tide for now. The water has cooled off and there are still mullet schools around to fish. Have fun and be safe out there! Night fishing around the jetties has been good for snook and redfish lately. Top water, DOA Bait Busters or live bait have all been good to use. Around the area, look for trout on the grass flats, redfish around the mangroves and docks along with snook and snapper. Make sure you are protecting yourself from the sun. The damage you do when you are young can haunt you later in life! THE NORTH JETTY REMAINS CLOSED EAST OF THE GATE DUE TO HURRICANE MATTHEW. WE HOPE TO HAVE THE STRUCTUAL ENGINEERS IN TO INSPECT THE JETTY LATE THIS WEEK IF CONDITIONS ALLOW. CONDITIONS DO NOT PERMIT AN INSPECTION AT THIS TIME. ONCE THE JETTY PASSES INSPECTION, WE WILL BEGIN TO REPLACE THE GRATES THAT ARE ON SITE WHICH WILL ENABLE US TO OPEN MORE OF THE NORTH JETTY DURING THE DAY. THE NIGHT TIME CLOSURE WILL STILL BE IN EFFECT. THE STATE PARK IS OPEN FROM 8:00 A.M. - SUNSET ON BOTH SIDES BUT THE BOAT RAMPS REMAIN CLOSED UNTIL THEY CAN BE REPAIRED. It's a beautiful morning at the inlet, a little windy but very nice. Winds are blowing out of the West-Northwest at 20 mph, gusting to 24 and there is a moderate chop on the water. The forecast for the week looks like we will continue to have bumpy seas. The king tide is subsiding but we still have a moderate risk of rip currents today. Tommy Turowski at the Sebastian Inlet Bait and Tackle Shop said the bite is good. Big Jacks and Snook are the prevalent bite but we are starting to see Blues, Flounder, Black Drum and Sheepshead. The winter species are beginning to arrive! Our photo today is courtesy of Charlie Achinelli of Melbourne. Charlie landed the 19"Cubera Snapper in the Tide Pool on Thursday! Charlie is a native of Miami and this is his first one, hence the nice smile! Charlie also landed one C/R Snook and three Sheepshead that day. Inshore, the snook fishing has been decent at the bridges in Fort Pierce and Stuart at night, the South Bridge in Fort Pierce and 10 Cent Bridge in Stuart on the outgoing tide, bait of choice is flair hawks or free-lining a live mullet. 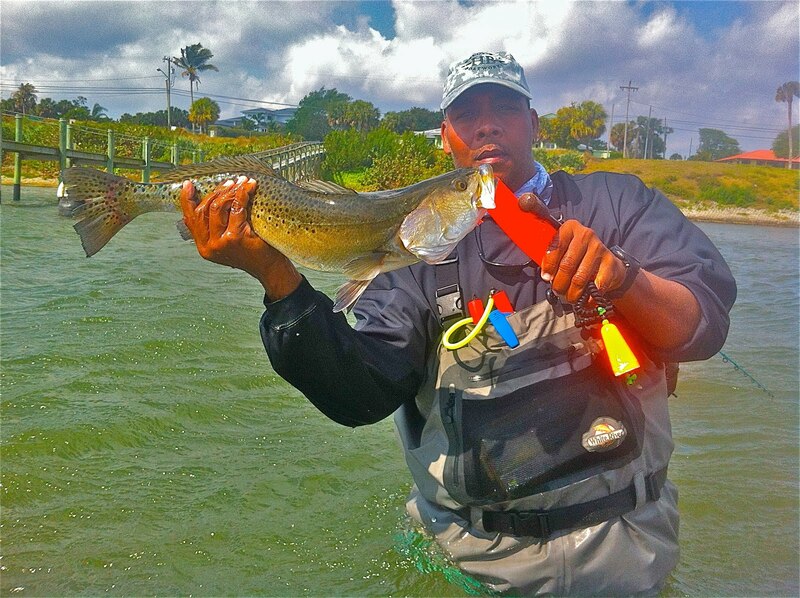 Trout have been reported north of Fort Pierce around Harbor Branch, the new DOA 2.75″ Shrimp have produced well. INSHORE: Snook fishing remains fair inshore, and could improve greatly with a little clean water. The bridges are producing snook at night on moving water. IN the dirty water keep the baits big, flashy, and loud. The fish need all the help they can get to find them! Large swimming plugs, bright colored flair hawks, and live mullet are all good bait choices for the snook right now. Other action inshore has been fairly quiet. A few jacks moving around, but overall it is a little tough. The ICW up towards Hobe Sound is starting to hold a few fish, and could also see a big improvement with some cleaner water and change in weather. SURF/PIER: Tough week overall with the weather and dirty water. If the water clears up along the beach over the next few days, it should be on! Look for the mackerel, jacks, ladyfish, and bluefish to out in full force and hungry. Spoons, diamond jigs, gotcha, and big swimming plugs should all work for the above listed. Pompano could also show up in good numbers. If the water doesn't clear up for our local area, consider a trip down south. Boynton INlet south along the beach seems to be holding a fair amount of fish. The surf fishing has been affected by the wind and rough conditions along the Treasure Coast as well. There wasn’t much action to report this week, but when the winds lie down, pompano, Spanish mackerel, whiting and croaker should all be biting along Jensen Beach. The snook bite has been excellent on the east side of the Indian River around bridges and seawalls. The redfish bite has also been great for early fall. The best action seems to be around Little Mud Creek. Bluefish, jacks and Spanish mackerel are being caught in the surf along Boynton Beach, and anglers fishing the jetties are catch them as well. They’re also hooking ladyfish, snapper, snook, and the occasional redfish and flounder. The surf fishing has been non-existent this week along Jupiter. The waves have made it nearly impossible to get and keep a bait in the water and, besides, the water is too dirty so there aren’t any fish around other than catfish. The Intracoastal Waterway in the Jupiter area has been good for catching jacks and snook. Both can be found near bait schools, and the night fishing around docks, bridges and seawalls has also been productive for targeting snook. 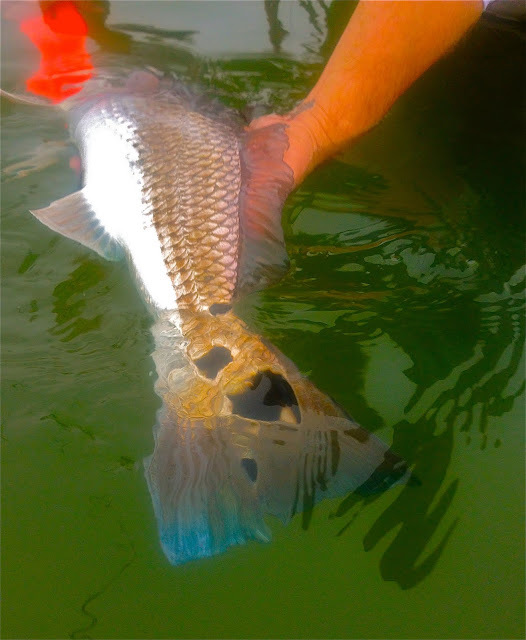 Small tarpon are hitting near mangrove islands in the Loxahatchee River. Those fishing the Intracoastal in central Palm Beach County – from Palm Beach to Boynton Beach - are catching snook, tarpon, ladyfish, jacks, snapper and bluefish. The best spots have been around the flats and channel edges. Bridges and docks have been best for snook. A few redfish and flounder were also snagged around bridges. The bass fishing was excellent on Lake Okeechobee this week. Good numbers and sizes were reported, including a couple 7-pounders. While the early-morning bite is still best, bass are now being caught throughout the day and night, and that will continue to improve as the weather gets cooler. The outside grass line and offshore islands have still been extremely productive, and live shiners are working best. You can definitely have success with artificial lures, however. THE NORTH JETTY REMAINS CLOSED EAST OF THE GATE DUE TO HURRICANE MATTHEW. WE HOPE TO HAVE THE STRUCTUAL ENGINEERS IN TO INSPECT THE JETTY LATE NEXT WEEK. CONDITIONS DO NOT PERMIT AN INSPECTION AT THIS TIME. ONCE THE JETTY PASSES INSPECTION, WE WILL BEGIN TO REPLACE THE GRATES THAT ARE ON SITE WHICH WILL ENABLE US TO OPEN MORE OF THE NORTH JETTY DURING THE DAY. THE NIGHT TIME CLOSURE WILL STILL BE IN EFFECT. THE STATE PARK HAS REOPENED THE REST OF THE SOUTH SIDE, EXCEPT THE BOAT RAMPS WHICH REQUIRE REPAIR. THE STATE PARK IS OPEN FROM 8:00 A.M. - SUNSET ON BOTH SIDES. Conditions are starting to calm down, winds are blowing out of the West-Northwest at 9 mph, gusting 15 and there is a moderate chop on the water. NOAA has issued a small craft advisory for seas through this evening and a small craft advisory is in effect from this evening through Saturday morning. Tommy Turowski noted that the no see 'ums are out and biting this morning, be sure to take insect repellent if you head to the inlet today! We are still seeing bait in the water but the schools are starting to spread out. We received an update from Charlie Achinelli of Melbourne who fished the Tide Pool yesterday. Charlie reported that Sheepshead are moving in, he landed three with the largest being 16". A Cubera Snapper found its way to the end of his line and C/R Snook did as well. Our angler of the day is Nancy Tu of Orlando. Nancy had a very successful day of fishing. Nancy was fishing off the seawall of the north jetty when she landed the beautiful 25" Flounder in photo one using shrimp. Nancy also brought in a 21" Sheepshead in the same place using shrimp. Inshore fishing has been in Stuart has was good last night with many snook being caught on the docklights and off the bridges. DOA Baitbusters and Vudu mullet have still been the go to lures. In Ft. Pierce the night time snook bite has been good at the inlet and at south bridge. Many slot Snook are being caught with a few Cubera Snapper mixed in. The flats from Bear Point to the Power Plant are still holding Trout and Redfish. Big Dave's land based lessons. How to get tight! I've started investigating some reliable reports of flounder and I'll be at it again in the morning. So, I though I might share how I approach fall flounder. This time of year is typically when southern and gulf flounder begin their spawning run. Now, there are a few triggers to the bite but I truly feel that wind direction and water temperature are %90 of it. Post cold front conditions being a cool or cold North East breeze of 10-15 mph, water temperatures of 72 degrees and dropping, emerald green water with a light chop are my preferred conditions. The presence of large schools of finger mullet doesn't hurt either. I find that tide has little to do with the fish's feeding activity but everything to do with their location. The fish will move between tides on the slack and take up positions in depressions in the bottom once it's roaring. That being said, it goes without saying that it is a rocky, not sandy bottom, that best serves as a staging area. Your looking for broken bottom in 1-4 feet of water. Look for the fish to be laying between the largest rocks or in the sandy holes scattered throughout the area. I find that the biggest fish actually prefer to hang out in the heavier current. Flounder are built for ambushing prey in fast water. The current keeps them down, making it easy for them to conserve energy. Heavy current also makes it harder for small prey to maneuver. Simply put, if you want big fish, fish the current. Smaller fish tend to stack up in slower, sandy areas. 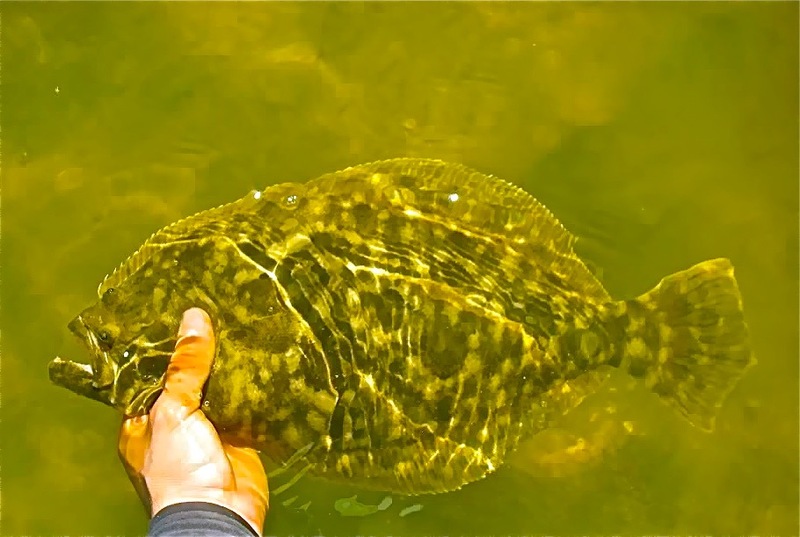 The first and last push of flounder of the year are frequently the larger dominant fish. Targeting them means being patient and utilizing baits many might consider to large. My favorite are 4-5 inch mullet, small pigfish or croakers no bigger than three inches and mojara. Larger baits tend to eliminate most of the fish ranging under about 18 inches on average. Fishing big baits means shortening your leader to no more than 8 inches. These baits are stronger and faster then smaller offerings like tiny finger mullet or mud minnows and are therefore harder for the fish to catch. By keeping them on a shorter leash, you keep them in the strike zone and in doing so, encourage more bites. THE NORTH JETTY REMAINS CLOSED EAST OF THE GATE DUE TO HURRICANE MATTHEW. WE HOPE TO HAVE THE STRUCTUAL ENGINEERS IN TO INSPECT THE JETTY LATE NEXT WEEK. CONDITIONS DO NOT PERMIT AN INSPECTION AT THIS TIME. ONCE THE JETTY PASSES INSPECTION, WE WILL BEGIN TO REPLACE THE GRATES THAT ARE ON SITE WHICH WILL ENABLE US TO OPEN MORE OF THE NORTH JETTY DURING THE DAY. THE NIGHT TIME CLOSURE WILL STILL BE IN EFFECT. THE STATE PARK IS TRYING TO REOPEN THE REST OF THE SOUTH SIDE, EXCEPT THE BOAT RAMPS WHICH REQUIRE REPAIR, BY FRIDAY. THE STATE PARK WILL BE OPEN FROM 8:00 A.M. - SUNSET. We still have windy conditions at the inlet. North-Northeast winds are blowing at 14 mph, gusting to 17 and there is a moderate chop on the water. There is a high risk of rip currents along East Central Florida beaches today. Seas remain elevated and we have hazardous boating conditions, particularly around inlets on the outgoing tide. NOAA has issued a small craft advisory through Thursday evening. We received an update from Charlie Achinelli of Melbourne who fished the inlet Friday and Saturday. He reported an unreal Snook bite in the heavy surf on Friday and Saturday. Charlie landed a 19" Flounder on Saturday and an undersized, 26" C/R Snook. Reds and Jacks were in the mix as well. Photo one is of Charlie?s 19" Flounder and photo two is of his C/R Snook. THE EAST END OF THE NORTH JETTY IS CLOSED. WE LOST 45 GRATES DURING HURRICANE MATTHEW THAT WILL NEED TO BE REPLACED AFTER A STRUCTUAL INSPECTION IS DONE. THE NORTH SIDE OF THE SEBASTIAN INLET STATE PARK IS OPEN FROM 8:00 -SUNSET, INCLUDING THE CATWALK. THE SOUTH SIDE IS PARTIALLY OPEN, THE SAME HOURS. THE SOUTH JETTY, SOUTH CATWALK AND T-DOCK ARE OPEN BUT THE BOAT RAMPS AND CAMPGROUNDS ARE NOT ACCESSIBLE AT THIS TIME. PLEASE DO NOT ENTER THE PARK WHEN IT IS CLOSED, WE WILL KEEP YOU UPDATED. We have Northeast winds blowing at 11 mph, gusting to 16 and there is a moderate chop on the water. The moderate chop on the ICW will create hazardous conditions at the inlet on this evening's outgoing tide. NOAA has issued a small craft advisory from 4:00 p.m. today through 6:00 a.m. Thursday morning. We could see quick downpours along the coast this morning. We received an update from Mike Ricciardi of Vero Beach who took a "stroll" yesterday out to the short portion of north jetty that remains open. 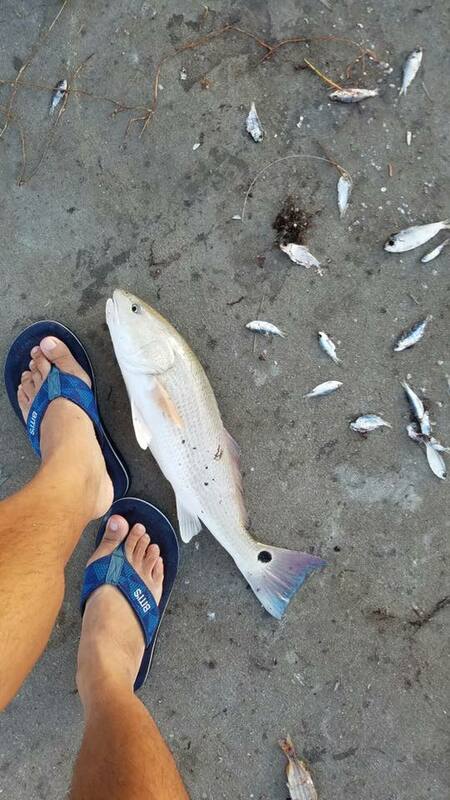 Mike said lots of Reds were being landed on the outgoing tide along with a few short Snook. There was a lot of bait in the water and a few big Jacks were landed along with a few Catfish. Inlet regular Luis Segura of Palm Bay landed a nice 21" slot Red while he was there. Joshua Nickerson is featured in our first photo today. He was fishing with his friend Jesse Boudet when they both landed slot Snook. Joshua is featured with both keeper Snook. Our second photo is courtesy of Jessica Vasey. Jessica was with her husband who was fishing on the north catwalk October 13th and decided to snap a few shots of the sunset over the Tide Pool. She added the border through Google photos, but the colors were not enhanced. Inshore Snook fishing is still hot, live bait, any swim bait ( storm, vudu, etc) and rapala lipped plugs will get bites. The jetty, and Jensen as well as Stuart causeway have held fish. Also heard of some scattered trout and redfish near the moorings on live mullet and topwaters. With all this wind and rough water it's been hard to fish like you would want to, but there are fish being caught. 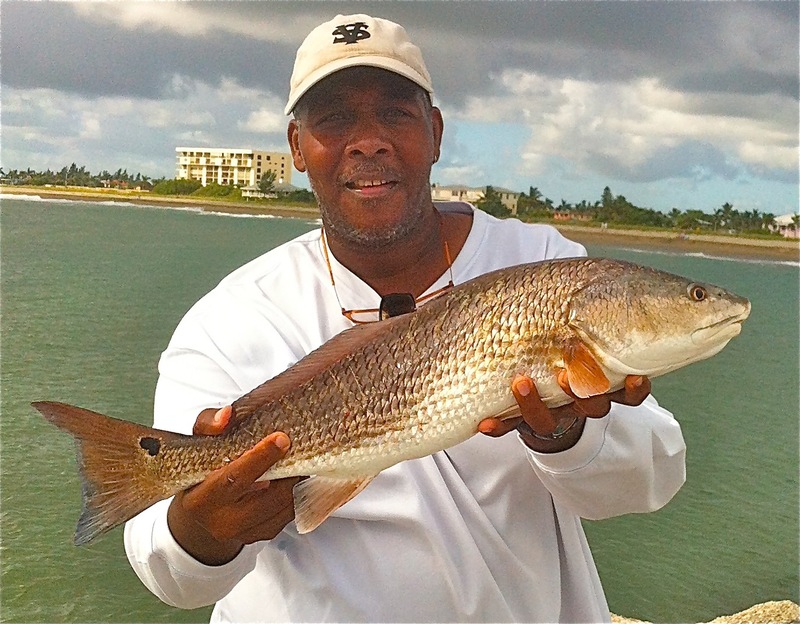 there have been a few Red Fish caught at the Boynton Jetty this past week. just wait until the water calms down a little.. THE EAST END OF THE NORTH JETTY IS CLOSED. WE LOST 45 GRATES DURING HURRICANE MATTHEW THAT WILL NEED TO BE REPLACED AFTER A STRUCTURAL INSPECTION IS DONE. THE NORTH SIDE OF THE SEBASTIAN INLET STATE PARK IS OPEN FROM 8:00 -SUNSET, INCLUDING THE CATWALK. THE SOUTH SIDE IS PARTIALLY OPEN, THE SAME HOURS. THE SOUTH JETTY AND CATWALK ARE OPEN BUT THE T-DOCK, BOAT RAMPS AND CAMPGROUNDS ARE NOT ACCESSIBLE AT THIS TIME. PLEASE DO NOT ENTER THE PARK WHEN IT IS CLOSED, WE WILL KEEP YOU UPDATED. We have another windy, choppy day at the Inlet. Winds are blowing out of the North-Northeast at 19 mph, gusting to 21 and the water is rough. NOAA has a small craft advisory in effect through Saturday evening and it looks like our boaters have another weekend of sitting on the dock, boating conditions are lousy and there's a ton of debris in the water. The rough conditions have really stirred up the bite. We have a ton of bait in the water, schools of mullet, mojarra and greenies are luring in a lot of predators. There are a lot of Snook, Reds, Ladyfish, big Jacks and Flounder in the 5 - 7 lb. range. Get out and wet a line. Our photos today are courtesy of Diana Densmore of Kissimmee. Diana and her husband Tom had a great day on the north jetty. 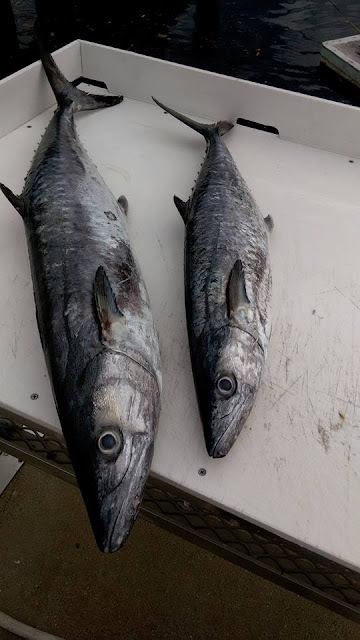 Tom landed 2 good sized Spanish Mackerel and a big Jack. Diana landed the huge Snook in our first photo and the hefty Spanish Mackerel in photo two. She landed the big Snook on a very small greenie on tight tackle; 12 lb. line which was the max for her reel with a 40 lb. mono leader. She estimated the Snook was around 38" as her net is 32" and it was hanging way over the sides when they brought it over the rails. They didn't take the time to measure it as they wanted to get it back into the water as soon as possible. Diana noted that the glove was strictly for thumbing the reel as this big guy was peeling line like crazy and she didn't dare tighten the drag! She and Tom also saw a lot of Blue Runners, Snapper and large Macks come over the rails while they were there. She sends out thanks to all those who cleared the way and cheered her on and she loved the great crowd of sportsmen who shared bait and helped each other land fish. Bringing the big Snook in on light tackle will require re-spooling as it mangled her line pretty good but it was worth it! The wind is still strong but the river fishing has been good for those that don’t mind a little wind. The snook fishing has been great around the bridges and inlets with live bait and jigs on both the incoming and outgoing tide. The flats fishing has been good with some nice reds, snook and a few trout around the mullet schools right in the mangroves around first light and just before dark top water plugs have worked well. 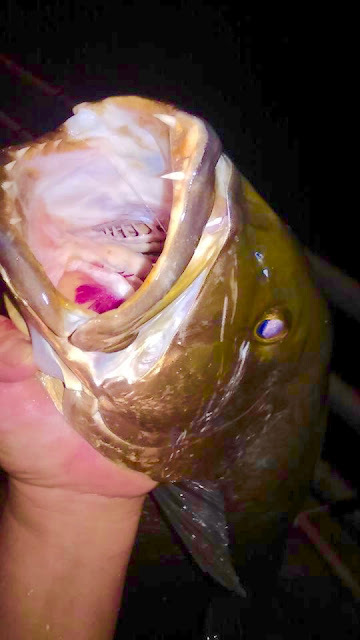 The dock lights at night in the Stuart area have had a few nice snook and trout around them at night live bait and swim baits have produced the best. Strong winds and poor conditions have also rendered the surf fishing non-existent along Jensen Beach and much of the Treasure Coast. However, the snook fishing has been excellent in the Indian River over the past few days, and the action should remain hot in the near future. The east side of the river has been best, but snook are also being caught around bridges. Tarpon and jacks are also in the mix, but be sure to throw big baits that can cut through the heavy winds that are still plaguing the area. Spanish mackerel, bluefish and jacks are all chewing in the surf along Jupiter. In the Intracoastal Waterway, jacks and snook are being caught around the bridges. Snook can also be caught around dock lights at night. A few tarpon were also reported this week. 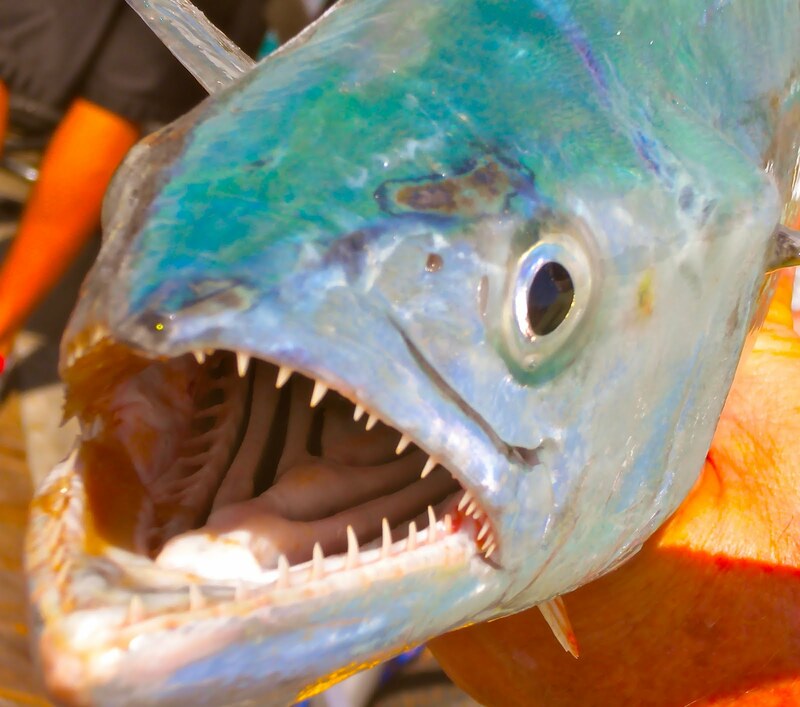 Jacks, bluefish and ladyfish have all been caught in the surf along Palm Beach this week. There haven’t been a lot of anglers out there, so the reports are few and far between, but there are definitely fish moving through the area. Fishing the jetties around the Boynton Beach Inlet has been great for catching mangrove snapper, snook and cobia. There are also Spanish mackerel and bluefish cruising the beach in the morning. Those fishing the Intracoastal in central and southern Palm Beach County are reporting mutton snapper, jacks, ladyfish and snook around the channel edges. 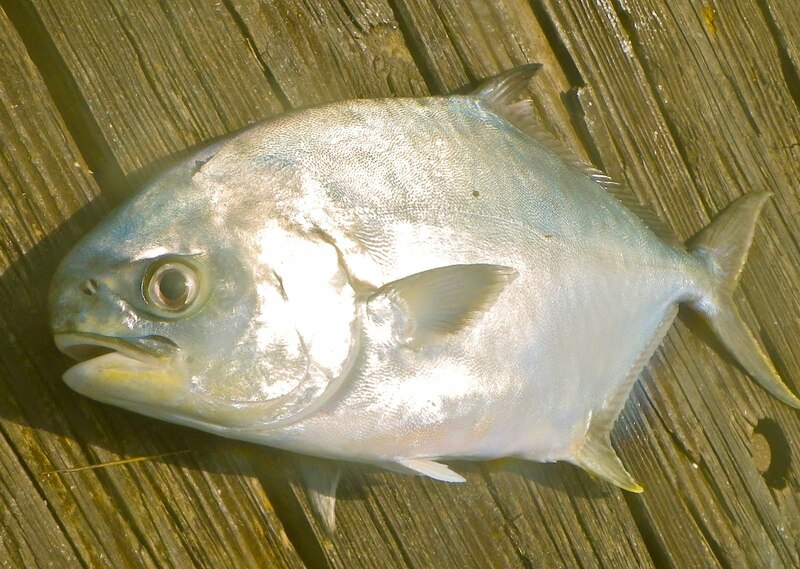 Jacks are also being caught around bridges, along with snook, mangrove snapper, bluefish, ladyfish and tarpon. It has been a rough week of fishing on Lake Okeechobee. Weather hasn’t been ideal, but bass are still being caught. The offshore islands and outside grass lines are still the best places to catch fish. The early-morning hours are still the best time to be on the water, but the bite is now lasting into the late morning and early afternoon. The night-time action has been pretty good, too. Live shiners are the bait of choice, but artificial lures are certainly getting the job done as well. INSHORE: The snook fishing remains the main game in town right now. The bridge fishing remains the best bet, and with the current dirty condition of the water you can catch them on both incoming and outgoing tides. Flair hawks, X-Raps, and live mullet remain the baits of choice, and with a water cool down coming throw those big baiters while you can. Still some mullet coming through so in addition to the snook, a few tarpon and big jacks are realistic possibilities. Other inshore action remains spotty at best. SURF/PIER: Depending on water conditions, the fishing could really fire off along the beach this weekend. A little cleaner water could have the spanish mackerel, bluefish, ladyfish, jacks, and even some pompano feeding like crazy. Looks like it's going to be rough so get the surf tackle, heavy leads, big spoons, and other essentials ready to deal with wind and waves. Low light periods of the day will remain key. Could still see some snook on the beach, and it's still a very good chance we could see some tarpon on the beach. THE NORTH JETTY IS CLOSED INDEFINITELY. WE LOST 45 GRATES DURING HURRICANE MATTHEW. AT LEAST 15 WILL HAVE TO BE ORDERED AND REPLACED. WE ALSO HAVE STRUCTUAL ENGINEERS COMING TO PERFORM AN INSPECTION BUT DUE TO ALL THE DAMAGE AROUND THE STATE, IT WILL BE A FEW WEEKS BEFORE THEY CAN GET TO US. WE WILL KEEP YOU ADVISED OF ANY UPDATES. THE SOUTH SIDE OF THE STATE PARK IS CLOSED INDEFINITELY AND THE NORTH SIDE IS ONLY OPEN FROM 8:00 A.M. TO 7:00 P.M. IF YOU NEED TO SPEAK TO SOMEONE AT THE PARK, PLEASE CALL 321-984-4852. PLEASE DO NOT ENTER THE PARK WHEN IT IS CLOSED, YOU WILL BE ARRESTED. We have another windy, choppy morning at the inlet. Winds are blowing out of the North at 17 mph, gusting to 21 and the water is rough. NOAA is calling for a small craft advisory that is in effect through Friday morning. We have a moderate chop on the ICW and a chance of isolated showers today. We understand that the rough conditions have the fish in a feeding frenzy. We have a lot of bait in the water and yesterday a lot of big Jacks were landed, a lot of undersized Snook and a few that were in the slot. Check out the nice Flounder that 14 year old Donald Gomez of Vero Beach landed! Donald was fishing the south side of the inlet using live shrimp to land this nice fish. We hope this is a sign of good things to catch Donald! Photo two is of a big Jack Donald landed the same day using live mullet. THE NORTH JETTY IS CLOSED UNTIL WE CAN REPLACE THE GRATES THAT WERE BLOWN OUT DURING HURRICANE MATTHEW. WE WILL KEEP YOU APRISED OF THE SITUATION THROUGH THE FISHING REPORT AND ON OUR HOME PAGE ADVISORY. ONCE THE GRATES ARE REPLACED, THE SUNSET TO SUNRISE CLOSURE WILL BE IN EFFECT FOR A TEMPORARY PERIOD. WE WILL NOTIFY YOU OF ANY CHANGES THROUGH THIS REPORT. THE SEBASTIAN INLET STATE PARK IS OPEN ON THE NORTH SIDE BUT THE SOUTH SIDE REMAINS CLOSED INDEFINITELY. IF YOU NEED TO SPEAK TO SOMEONE AT THE STATE PARK, CALL 321-984-4852. We have a very windy morning at the inlet. Winds are blowing out of the North at 27 mph, gusting to 32 and the water is choppy. NOAA is calling for hazardous boating conditions and a small craft advisory is in effect through Oct. 12th at 8:00 p.m. We have a chance of isolated showers throughout the day today. From what we've been hearing, the fish are hungry after Hurricane Matthew. The storm stirred everything up and fish have been everywhere, particularly on the flats. Reds, Tarpon, big Jacks, Snook, Flounder and even a few Blues have started to show up along the beaches. Our first photo today features 14 year old Melbourne High School student Gregory Prieto. Gregory landed the beautiful 18" Mangrove Snapper from the north jetty using live shrimp. Photo two features Jason Stephens of Kissimmee. Jason landed the 30" slot Snook in the photo on a giant shrimp from the tip of the north jetty. The Bluefish arrived in force today at the north pier....beachside. I arrived at 11:40am and Bluefish were already coming over the rails. Most were in the 1-2 lbs, but there were quite a few caught in the 6-8 lbs range, as well as a few hefty Jacks mixed in. There were plenty of people getting in on the action, but somehow it did not get chaotic or out of control. The one or two Googans present were swiftly provided information, and they quickly complied. I caught at least 30 Bluefish. The biggest was 5 lbs. Had one that made my drag scream for a few seconds before my line popped. All in all lost 4 lures.....those Bluefish are vicious!!! Go get yours!!! Everything happened on the incoming tide!! 10-10-16 MONDAY: WHAT A RIDE! We are getting our office back together after Hurricane Matthew. Our office in Indialantic has reopened. The Sebastian Inlet State Park's north side is open. The north jetty is closed. We lost 45 grates from the north jetty, 33 remained on the deck but several of those are mangled. Over a dozen grates will need to be replaced before the jetty will reopen, we will advise when we have a date. When the north jetty reopens, the sunset to sunrise closure will remain in effect. The south side of the State Park remains closed indefinitely. If you would like to speak with someone at the State Park, please call 321-984-4852. The fall mullet run will continue to dominate the area as large schools of finger mullet fill the beaches, inlets and rivers of the area. It has been an active season this year. You can expect lots of big fish to be feeding on them both day and night. Snook fishing will be best during the night hours on the higher ends of the tides. Live finger mullet, croakers and pigfish will be the best live baits to use. DOA Terror Eyz, Bait Busters and feather jigs will be good artificial lures to use for snook. Try around the jetties, turning basin and bridges as well as many of the deeper docks around the river. Lighted docks are especially productive when fishing at night. Redfish has continued to be a wonderful fishery for us again this year. Each year has seen their population increase and many anglers have enjoyed the experience of fishing a large school of reds this year. October will continue to be a productive month for those who seek redfish on the flats. The new DOA 2 3/4“ shrimp or CAL grub tails are two of the best choices for redfish along with a variety of live and cut baits. The west shoreline south of Fort Pierce is always a good area when looking for redfish. The trout bite will be good this month. Get out early with a top water lure for some exciting action on the river. Switch to a DOA shrimp or CAL jerk bait later in the mornings. Harbor Branch, Queen's Cove and Middle Cove are all great areas to fish for trout around the Treasure Coast. Look for some sheepshead, black drum and snapper around the bridges, docks and channel edges. The surf will be alive with jacks, snook, bluefish and other predators, which will all be chasing the bait schools along the beach. It's another great month to fish along the Treasure Coast! 10-04-16 TUESDAY: HEAD EAST MATTHEW! THE NORTH JETTY GATE HAS BEEN INSTALLED. THE TEMPORARY SUNSET TO SUNRISE CLOSURE WILL BEGIN FRIDAY, OCTOBER 7TH. THANK YOU FOR YOUR COOPERATION. It's overcast at the inlet this morning. Winds are blowing out of the East-Northeast at 5 mph, gusting to 7 and there is a moderate chop on the water. We have a chance of showers and potential thunderstorms this afternoon. Conditions will deteriorate through Friday or Saturday with Hurricane Matthew making his way towards the east coast of Florida. We received an update from Mike Ricciardi of Vero Beach who fished the north jetty yesterday. Even with the blustery conditions, the Snook and Redfish bite was good. Waves were crashing up through the jetty grates and that was making the anglers wetter than the few drops of rain that occurred. Mike had a good day with Snook, landing three. One was 36", one was 34" and one was in the slot at 29". Mike reported a lot of greenies schooling around the jetty and he was actually fishing for Snapper when he landed the first two Snook using them. Mike switched to shrimp on the incoming tide when he landed his slot Snook. A few Snapper came over the rails and a lot of Jacks in the 2 - 4 lb. range were landed. Mike is featured in our first photo today, nice catch! Photo two features Chris Saccucci of Jupiter. Chris made the drive up to fish the inlet. Chris was using mullet on the south side on the outgoing tide when he hooked up with the nice Flounder and slot Red. 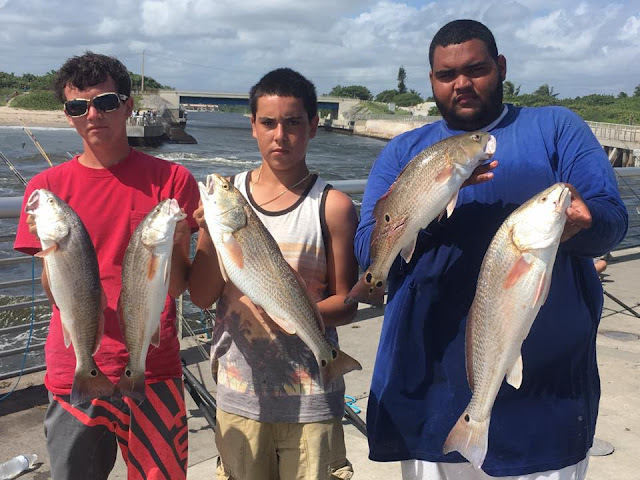 Chris reported that other anglers landed Jacks and Reds as well. THE NORTH JETTY GATE HAS BEEN INSTALLED. THE TEMPORARY NIGHT CLOSURE WILL BEGIN FRIDAY, OCTOBER 7TH. We have a sunny morning at the inlet but we don't expect it to last throughout the day. We have good chances of rain and a slight chance of thunderstorms this afternoon. Winds are blowing out of the East at 10 mph, gusting to 13 and there is a moderate chop on the water. With Hurricane Matthew predicted to head offshore of the eastern seaboard, conditions will probably deteriorate through the week. Late Friday morning the bite was slow, only a few Lookdowns came over the rails but later in the afternoon several really large Snapper were caught on live and chunked finger mullet according to Mike Ricciardi of Vero Beach. Thanks Mike. Tommy Turowski of the Sebastian Inlet Bait and Tackle Shop reported a good bite over the weekend for Snapper. He reported Mangrove, Mutton and Lane (which are rare) Snappers came over the rails. Spanish Mackerel, Margate, Reds, Lookdowns and Snook were also active. 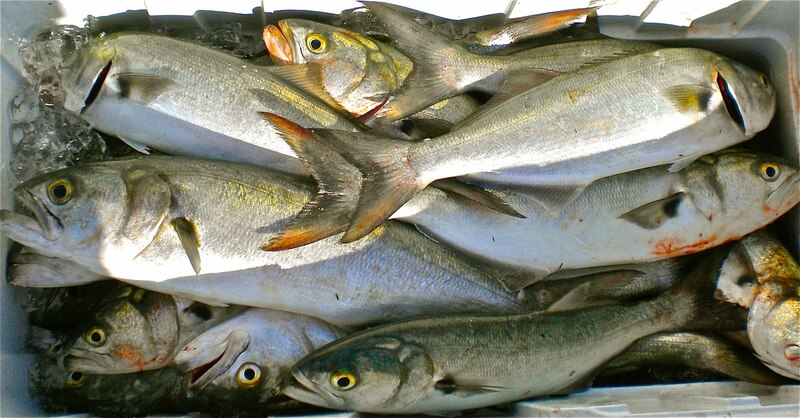 There are a lot of greenies in the water and schools of mullet are scattered. 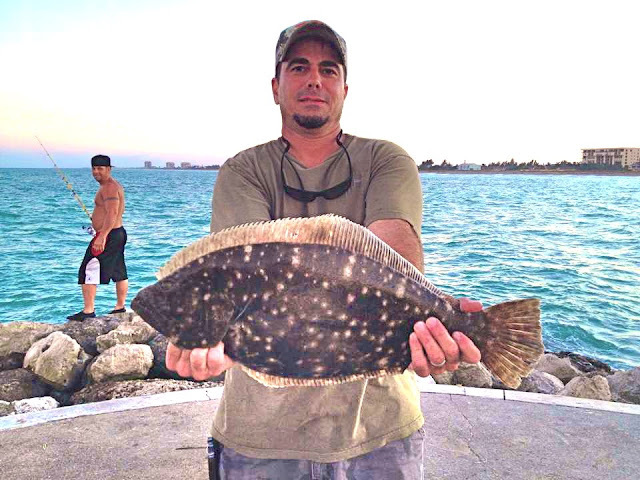 Inshore the bite has remained steady with reports of trout to the south at Bear Point in Fort Pierce on the outgoing tide. Snook are still being caught at the bridges in Fort Pierce and Stuart at night throwing flair hawks and live mullet. Tarpon are still roaming the beaches chasing the schools of mullet, big plugs and live mullet will be your best option to get a bite. How to Make Snook Rigs for Pier Fishing! Juno Pier Live Bait Snook Fishing and Breakoffs!